From now until 30 June, you’ll enjoy 6 Qantas Points per $1 spent on Australian car rentals with Avis. In this guide, I explore earn rates, the best booking channels, how to get cashback on car rentals, and a bonus for small business owners. Usually, you earn 4 Qantas Points per $ spent on Avis car rentals within Australia (for overseas rentals, it’s a flat 700 points per rental. However, for bookings made between 18 March and 30 June 2019—even for rentals for future dates such as October 2019—you’ll earn 50% more points. Given that we value Qantas Points at 2c a point, that means you are effectively getting a cashback of 12% on your rental. This is more than double the cashback you can earn through Cashrewards. Which companies can I earn Qantas Points with? 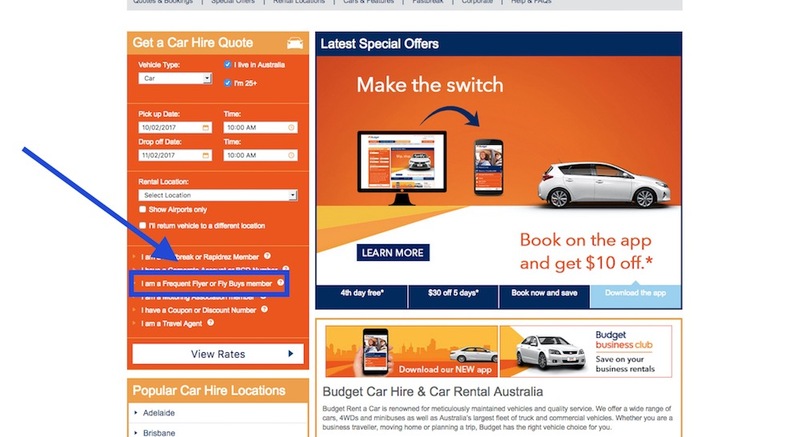 Avis and Budget are the exclusive car rental partners of the Qantas Frequent Flyer program, even though Qantas do advertise discounts on their site for rentals with Hertz and Thrifty. It is only the former two that will earn you Qantas Points, however. Regardless of whether you book directly with Avis or Budget or indirectly through Qantas Frequent Flyer, you will earn 4 Qantas Points per dollar spent on time and kilometre charges in Australia and 700 Qantas Points per rental overseas. My dummy test bookings between the Qantas website and booking directly through Avis or Budget showed less than a 20-cent difference in prices. 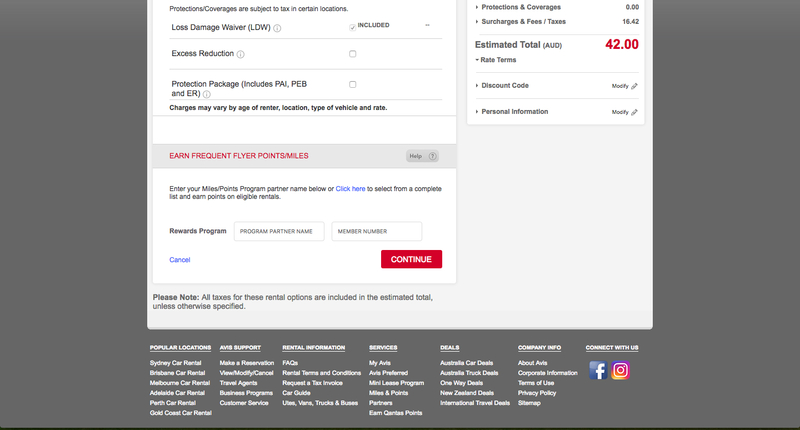 In terms of eligibility, earning Qantas Points on Avis and Budget car rentals made directly through them or through Qantas simply requires you to be a member of the Qantas Frequent Flyer program. 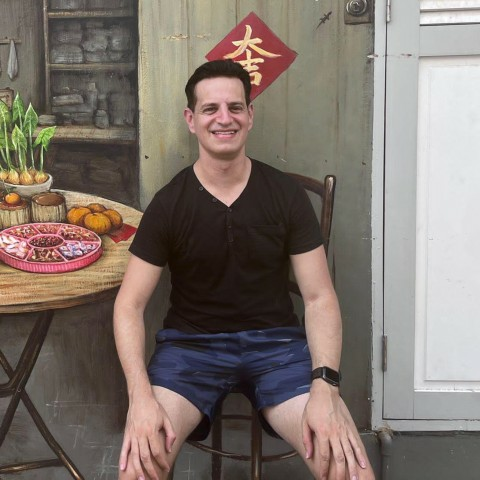 This is a welcome breath of fresh air from the usually cumbersome terms and conditions that are generally found in many points-earning activities. How do I make a points-earning booking? You can earn Qantas Points by directly booking through either Avis or Budget, or by booking indirectly through the Qantas site. All three involve a simple process. At the booking details screen, simply scroll down to ‘Earn Frequent Flyer Points/Miles’, select ‘Qantas Frequent Flyer’ from the partner list and enter your account number. The process for Budget is similar to that of Avis. At the Budget home page, click on ‘I am a Frequent Flyer or flybuys member’, select ‘Qantas Frequent Flyer’ from the drop-down menu and input your account details. 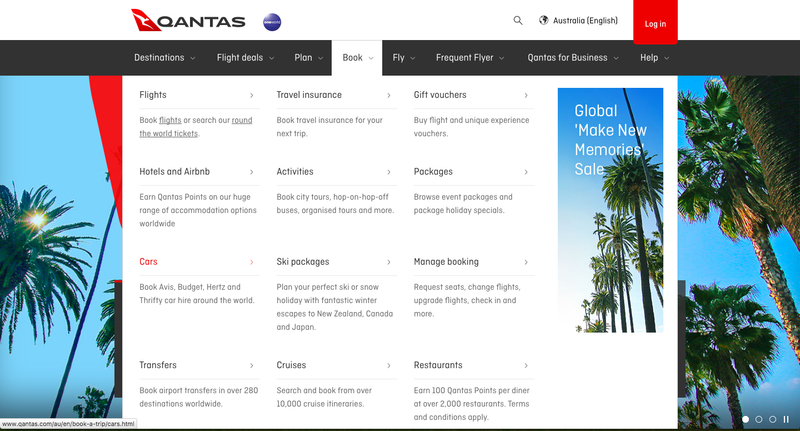 To book through Qantas, head straight to the Qantas website, scroll over the tab ‘Book’ and click on ‘Cars’. Once you enter your particular booking details, you are presented with a list of cars. At that point, make sure to go to the ‘Sort by’ drop-down menu at the top left-hand corner of the page and select ‘Frequent Flyer Partner’. 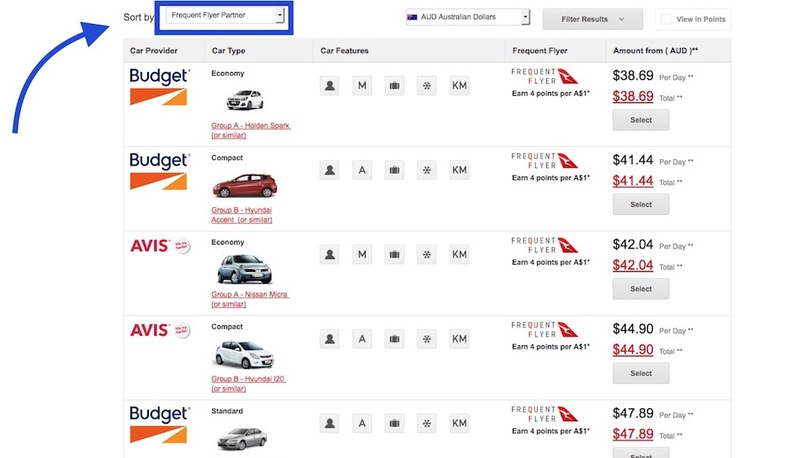 This filters results by placing Avis and Budget results at the top of the screen and clearly highlights the number of Qantas Points per dollar spent you’ll be earning on your rental. Points can also be earned from third-party travel providers such as Webjet, Expedia and Lastminute, with space provided to input your Qantas Frequent Flyer number. However, a word of caution: these sites generally have vague wording when it comes to earning Qantas Points, such as ‘available on selected rentals’ or are completely silent on the topic, so make sure to read any fine print before finalising your booking. Due to the breadth of third-party providers, I did not make pricing comparisons between these sites but would be interested to know readers’ experiences in regards to pricing. While the above booking methods provide identical perks in relation to earning Qantas points, both Avis and Budget are program partners of Cashrewards, which provide a 4.9% cashback on any Avis or Budget rental made through their site. 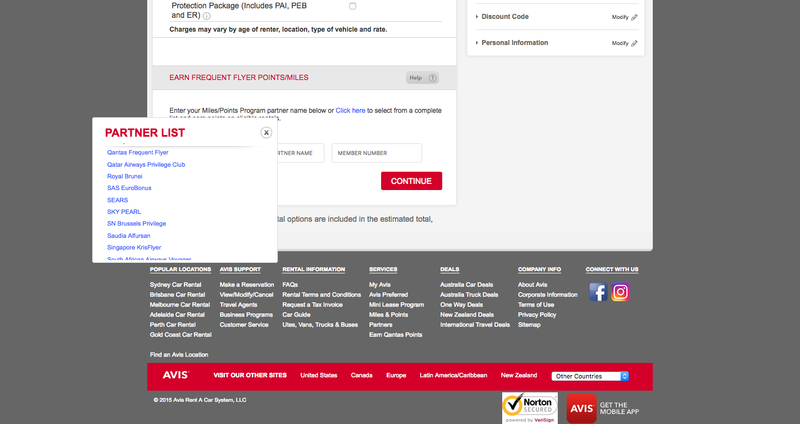 In this respect, clicking through to the Avis or Budget website from the Cashrewards landing page will yield you a discount, which is not available by going through the Qantas site directly. For readers holding active ABNs, make sure to book your Avis and Budget rentals in Australia through the Qantas Business Rewards site. In addition to earning 4 points per dollar for your personal frequent flyer account, you can also earn an additional 4 points per dollar into your Business Rewards account, which can be transferred to your personal Qantas account at a later date. Unfortunately, this does not extend to overseas rentals. If Qantas Points are your currency of choice, you will be limited to booking with either Avis or Budget for your car rental needs. While this is a somewhat limited choice given the number of available car rental providers, the good news is that there are many distribution channels available that will allow you to earn Qantas Points without any exclusions, as well as letting you shop around for the best deal. Make sure to maximise value by booking through Cashrewards or Qantas Business Rewards. I use a credit card that offers rental car insurance such as the American Express Platinum. You can also check with your car insurance company- most cover rental cars as well. Sounds good in theory so I logged into Qantas and tried to book cars in USA and Canada for an upcoming trip in July but search resulted in no cars available for the dates. Then I then went to Budget directly and found fulll range of cars available for the same dates. Small allocation to Qantas? Thanks for your feedback. 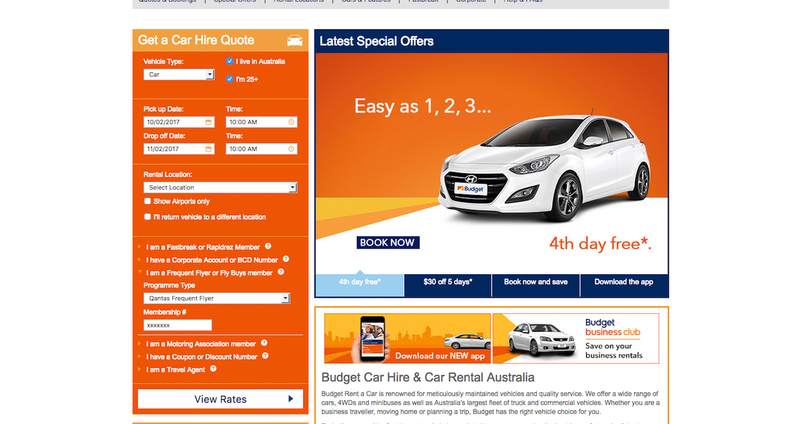 I only did a dummy search for a Sydney Airport car rental and found the availability for both Avis and Budget booked through the Qantas site to mirror that of their own websites, albeit with the Qantas site being a couple of dollars cheaper. From your experience, it sounds that the availability may be limited for overseas rentals. By any chance, did you just try Budget, or was thing occurring for Avis too?